Here we have shared latest full & free setup of Blackberry Easy Flasher. You can download it free of cost. Blackberry Easy Flasher is a free and useful tool for all Blackberry mobile phones. You can use as a flasher. Flashing of mobiles does at that stage if mobile is working slow or completely break with the reason of its outdated or corrupted firmware. If you will flash your phone with its latest flash files, your phone will be reset in its original settings so you will need to take a backup of your data. After successful flashing, you can restore your backup data to your safety. Please always flash your phone with updated firmware, because if you will flash phones with corrupted or outdated firmware, your mobile will be restored in its original settings. If you wish to flash your phone himself by using its latest flash files you will need to follow some simple steps. You will need to Connect your Blackberry device to your PC and then from the program interface select OS Download. You will be directed to Blackberry website and the supported files available for your phone will be displayed. Download the file you need and then use the Write flash button to load them on your phone. 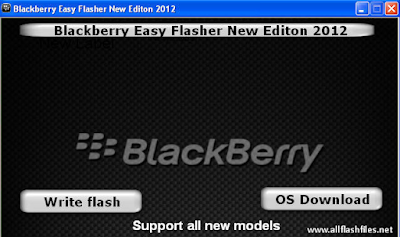 Now you can download the latest setup of Blackberry Easy Flasher from below download links. We are always trying to share free and official site download links so you can manage it easily. Official servers allowing visitors to download free apps, and they are releasing new updates for old apps. If you are facing difficulties during downloading just contact us via commenting, we will update download links very soon.